Because it is so good, i give the book rank 5 stars! Basically, it's complete, simple and yet comprehensive! 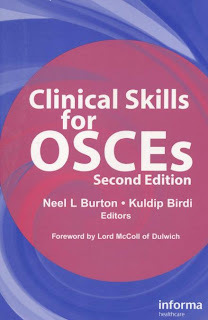 All the common OSCE's questions available. It list out questions about surgery, medical, obs & gynae, paediatrics, anaesthesia, psychiatric (i love this one), etc2. Some of them also talk about short case. So basically it also contain some short case examination questions! I mean it. It's a must for all clinical year medical student to have it! A nice review also in amazon. would you mind to send it to my mail?